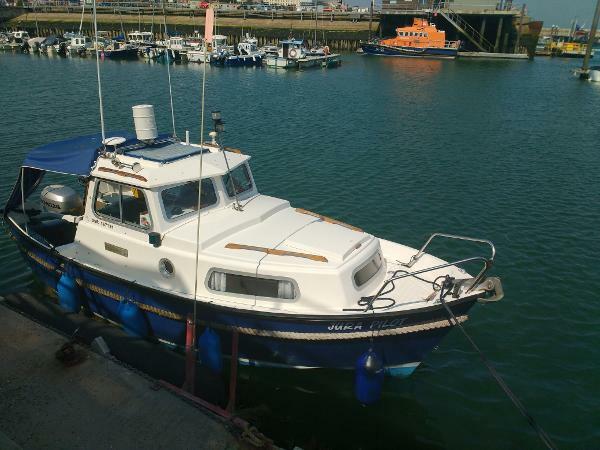 Specifications: Year: 1993 LOA: 6.10 m Beam: 2.44 m Draft: 0.61 m Construction: GRP Hull / Keel: Planing HIN: N/A Description: This extreemly seaworthy fisher/cruiser is presented in superb and fully opperational condition. Engine(s) & Electrical: Honda 75hp, 4-stroke. Last serviced: August 2018. Engine hours: 320. Maximum speed: 22kts. Fuel capacity: 106 litres. Twin batteries charged from the engine. 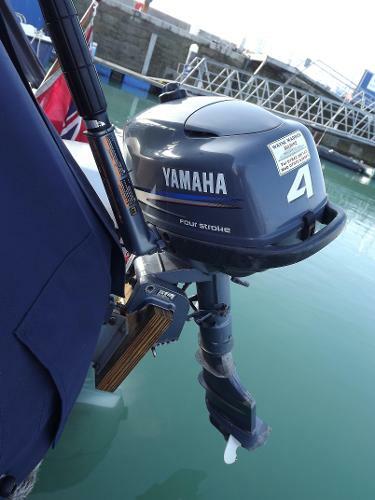 Yamaha 4hp, 4-stroke transom mounted auxillary with 12 litre fuel tank. Accommodation & Below Deck: 2/3 berths, standing headroom, cloth upholstery, curtains, carpeted, saloon table, Bluetooth stereo, chemical toilet, wash basin, holding tank, Plastimo cooker, galley sink, pumped cold water system. Deck & Canvas: Bruce anchor with 13m of chain & 40m or warp, jackstays, boarding ladder, forehatch, wheelhouse roof hatch, fenders, mooring lines, boathook, cockpit lockers, TV aerial, navy cockpit cover (new in 2018), cockpit cushions. Navigation & Safety: Garmin GPSMAP 751 plotter/GPS, Navtex, Duet log & depth indicators, Garmin EchoDV fishfinder, ICOM DSC VHF, ICOM M401 VHF, Plastimo compass, ICOM handheld VHF, navigation lights, barometer, clock, foghorn, radar reflector, 2 fire extinguishers, fire blanket, bilge pump, search light, lifebouy. Miscellaneous: Superspeed galvanised road trailer. Viewings are by appointment only. 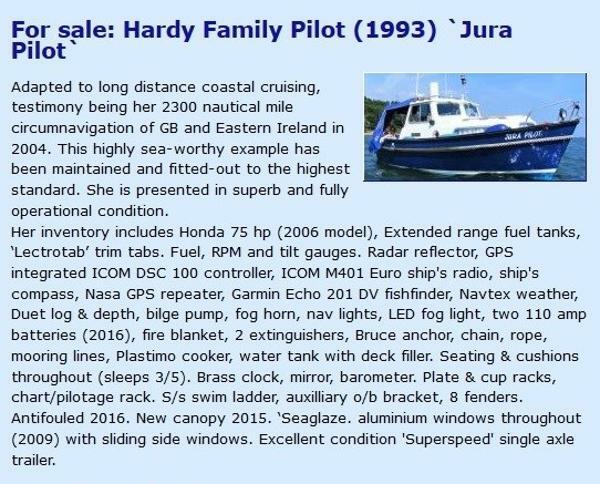 For an instant insurance quote call Euromarine Insurance Services on 01843 603345 Disclaimer: The particulars detailed herein are intended to give a fair description of the vessel, but their accuracy cannot be guaranteed. These particulars are supplied on the understanding that all negotiations shall be through Highway Marine Ltd who are acting as brokers for the vendor. The vendor is not selling in the course of a business unless otherwise stated. The prospective purchaser is strongly recommended to check the particulars, and where appropriate, at his own expense, to employ qualified independent agents to carry out a survey, and/or any mechanical and electrical checks. Venditore Marine Wizard International S.a.r.l.